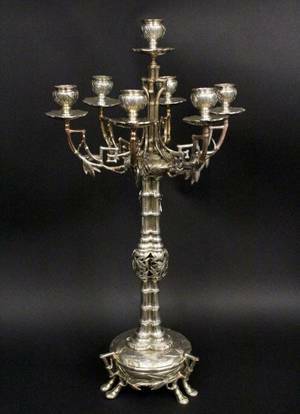 Christofle, Late 19th/Early 20th century. Rare and finely handled, ornate, possibly "Bambou" pattern, silver plated on bronze metal seven light candleabra in Aesthetic Movement style with all over bamboo stalk and leaved motif. Centerpiece with six candle holders terminating from arched bamboo form arms with additional scrolled decoration surrounding elevated central candle holders above grouped bamboo stalk shaft on a circular base raised on six animal form feet. Marked on bottom of animal foot "CHRISTOFLE" and "754133". Additional "B" mark on bottom of a different animal foot. Height 23.5", width (across arms) 11.75".